Everyone knows Lake Erie has a harmful algal bloom problem. The evidence is literally bright green, toxic slime on the surface of the lake’s western basin each summer. The blooms are caused by excess phosphorus. But how exactly do you solve the problem? 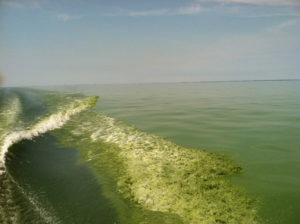 The Lake Erie Foundation wants to collect and analyze data to create the first-ever Lake Erie report card, a baseline that would measure the causes and economic impact of harmful algal blooms and analyze efforts to decrease the bloom. The nonprofit Foundation — created in 2016 by combining the Lake Erie Waterkeeper and Lake Erie Improvement Association — aims to “create and maintain a healthy Lake Erie now and forever as defined by drinkable water, recreational contact and edible fish.” It is working with researchers from the University of Maryland on the report card, which should be complete in 18 months. That goal may be easier now that the Ohio Environmental Protection Agency is declaring the western basin of Lake Erie impaired, a designation that matches the Michigan portion of the lake. The announcement came last week, after members of the Lake Erie Foundation lobbied the U.S. EPA to overrule Ohio’s original assessment. “What this now means they will be able to identify the biggest polluters,” said Foundation board member John Lipaj. Ohio has already reached an agreement with Michigan, New York and Ontario to reduce phosphorus discharges by 40 percent between 2015 and 2025. But so far, all efforts have been voluntary. The impaired designation may make some changes mandatory, Lipaj said. The Maumee River contributes half of all phosphorus in the lake, with about 85 percent of it from fertilizer runoff. The river’s watershed covers about 4.3 million acres. The size of the harmful algal bloom each year is mainly based on rain between March and July: how much rain and how hard it fell, how much phosphorus it carried into the lake. The report card would be released every two years. It would study the economics of the bloom — what it costs in lost tourism, increased drinking water testing and treatment — and which projects funded by the $300 million federal Great Lakes Restoration Initiative have the biggest effect. It would also measure the soil of farms around the Maumee, establishing “where the problem is coming from and the processes we’re going to go through to reduce it,” Stouffer said. It would study not only fertilizer, but also manure from cows, pigs and chickens. The Foundation is proposing to add a 3-cent charge to every pound of pork, chicken and beef sold in Ohio, so that manure could be properly processed, rather than left to run into stormwater. “Slowly but surely incrementally we are making headway in the agricultural community, getting the cooperation the farm community deserves,” Stouffer said.